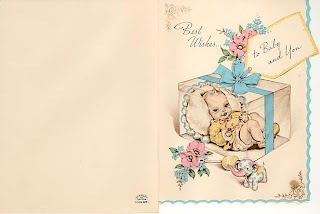 There are all sorts of surprises in Peggy’s Box of birth cards. One of the first being that not all the items in the box are cards. I was surprised to pull out a certificate of Whooping cough immunization. According to Wikipedia Whooping cough is one of the leading causes of vaccine-preventable deaths worldwide. Most of these deaths occur in the Third World though it is still commonplace in Canada. It further states that “After vaccines were introduced in the 1940s, incidence fell dramatically.” Before a vaccine was available, whooping cough killed 5,000-10,000 people a year in the United States. Peggy must have been one of the first babies to receive a whooping cough vaccine. She received three vaccine shots by December 1940 when she was six and a half months old. 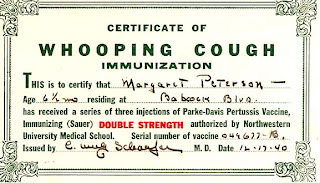 The type of vaccine Peggy received, according to the certificate, was one prepared according to the method of Dr. Louis W. Sauer (1885-1980). Dr. Sauer “was a pediatrician who became known for perfecting the vaccine used to prevent” Whooping cough. He taught at Northwestern University Medical School in Chicago which explains why Northwestern is listed on the certificate as the authorizing body. The Whooping cough vaccine she received in 1940 likely saved her life and that of countless others. 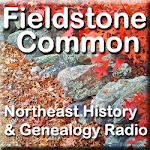 I was reading through blogs I follow on Bloglines when I stumbled across a FamilySearch.org update on Eastman's Online Genealogy Newsletter. It indicated that the United States, Illinois Cook County Marriages, 1871–1920 had been updated with new images and index content. Occasionally I check the Illinois records to see if my family have been included there yet. I have to admit I am a little confused about FamilySearch.org these days. I get confused between http://www.familysearch.org/, pilot.familysearch.org and labs.familysearch.org. I'm sure if I spent an hour some day I could figure it out. Regardless I knew instinctively that if I just went to the labs.familysearch.org site I could find the record group that I was looking for. I headed over to the website to take a look. I had a feeling that this time I would find just what I was looking for. I don't really have any family from Chicago. Well almost not really. 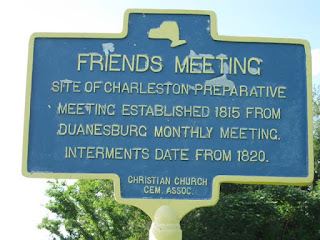 Some of my New York/New England ancestors ended up there for a generation. I've been on the hunt for my great great grandfather's death record and for my great grandparent's marriage record. I always thought it was funny that a Texas boy and a New York girl would get married in Chicago but somehow her family ended up there. When I pulled up the Cook County records index I held my breath and typed 'Dealey'. The first record that popped up was James Q. Dealey. Pay dirt!! My great grandfather's marriage record to Clara Learned at long last. 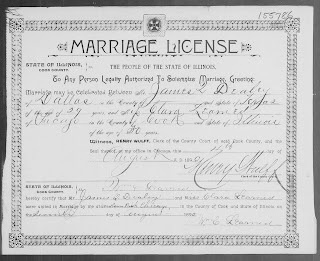 The image showed the marriage license and the confirmation of when the marriage had taken place. Better yet it was a family affair. The confirmation of their marriage was written and signed by Clara's father, clergyman William Chandler Learned. It also mentioned that they were married at Woodlawn Park. I've never heard of that. Sounds more like a cemetery to me. More research for another day. 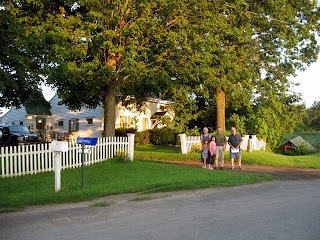 Now off to check out FamilySearch's 1892 New York census records….. 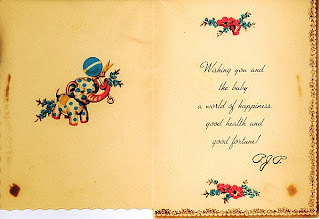 This note was sent to Peggy's parents in liu of a greeting card. The signature "Ruth & Roger" shows familiarity by the fact that they didn't feel the need to include their last name. It would be not easy to determine who Ruth and Roger were but I was up for a challenge. There was one clue that would make it a little easier. 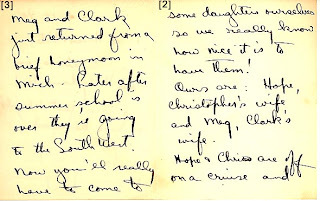 The note mentions their sons, Clark and Christopher. Clark is a fairly unusual name so I hoped that would help. Since Clark and Christopher both married th e same year that Peggy was born, 1940, I was going to guess that they were between 10-20 years old and still living at home in 1930. I first searched Ancestry.com's 1930 US Federal Census database for a man named Roger who lived in Pittsburgh with a wife named Ruth. I struck out. I opened my search up to all of Pennsylvania. I got a few hits but none of them had sons named Clark and Christopher. Clearly Roger and Ruth did not live in Pennsylvania as Peggy's parents had. I gritted my teeth and prepared to do a broad search of the United States for all Roger and Ruth couples. The search turned up 132 couples. Not too unwieldy a number to slog through. The new preview feature on Ancestry.com records really helped with this. I could hover over each Roger and check quickly to see if they had children named Christopher and Clark without having to actually click into each record. I made my way nearly through the whole alphabet before finding the family in the 'S' section. 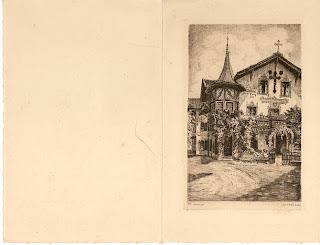 Roger Sergel and his wife Ruth F. Sergel lived in "Chicago City", Cook County, Illinois in 1930. Roger was 35 and born in Illinois. Ruth, an Iowa girl, was 36 years old. They had been married for 14 years by 1930. They rented a home for $90 a month on Wood lawn Avenue in Chicago and they owned a radio. In their household were Christopher, son, age 11, born in Iowa; Clark, son, age 9, born in Minnesota; Sherman, son, age 6, born in Iowa; and Nora O'Neill, a 49 year old servant from English speaking Canada. 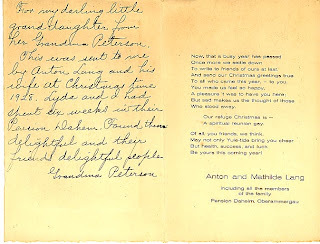 I was left wondering what their connection was to my Uncle Edwin "Petie" and Aunt Helen Peterson. The occupation column provided a bit of a clue. Roger Sergel was listed as a manager in a publishing house. However, it was an unexpected surprise to discover that Ruth Sergel was working too! She was a publicity writer in a publishing company. How glamorous and exciting to be a female publicity writer in 1930! Perhaps she worked for the same publishing company. It also got me thinking that perhaps she might have been one of Uncle Petie's students at Pitt. A quick peak at the 1920 US Federal Census found Roger and Ruth in Moorhead City, Clay County, Minnesota with 1 year old son Rodger. The ‘d’ was added to the son’s name but not the fath er. Was that a slip by the enumerator or intentional by the parents? In 1920 Roger worked as a “Normal” teacher. Other Ancestry.com searches showed that Roger died May 3, 1963. I decided to broaden my search to the whole web. I turned first to Wikipedia. It didn't turn up any result for Roger Sergel however I did find something on a Ruth. The entry said, "Ruth Sergel is an American director, writer, activist, and interactive technology designer in New York City." Perhaps this a descendant of the original Ruth and Roger. As for son, Christopher, I found a tribute to him on the Dramatic Publishing website where he was noted as being a former president of the organization. His birth and death dates were given as May 7, 1918 - May 7, 1993. According to the 1930 US Federal Census, Christopher was 11 years old. This would have him born around 1919. A 1918 birth year would certainly be plausible given the margins of error and accuracy for the census. This very likely is the son of Ruth and Roger. Christopher was a playwright and adapted many famous books and programs to the stage. I wouldn't feel quite satisfied until I checked for sons, Sherman and Clark. My search results turned up empty for Clark except for a Social Security Death Index showing him being born October 1, 1920 and having died in Illinois in November 1977. I also found a a 1955 Illinois marriage record for Clark and Virginia B. Bates on Ancestry.com. Could this have been a second marriage? 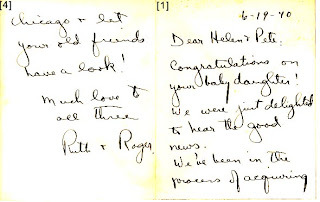 The 1940 note to Aunt Helen and Uncle Petie clearly has Clark married to a girl named Meg. Sherman, on the other hand participated in the family business, having written several plays including "Twelve Angry Women" with Reginald Rose. According to the Social Security Death Index, Sherman died on January 11, 1981. Passenger and Canadian Border Crossing entries were able to further corroborate family information and birth dates for the parents and the kids. Suddenly this investigation into Ruth and Roger was becoming quite exciting. The Sergels were certainly a talented family and very involved with the writing community. That fit well with what I said in my first blog post that Uncle Petie was a "writer's writer" and “inspired a generation of American authors.” Looking back at the careers of Christopher and Sherman, perhaps it was the sons who were students of Uncle Petie and not Ruth. 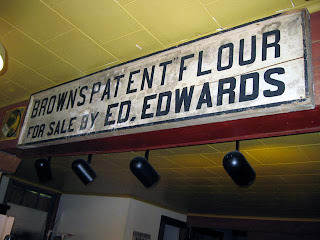 Note: page numbers in brackets have been added to the images to help follow the flow of text. 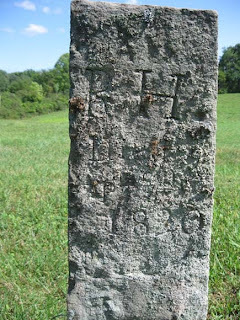 A simple tombstone in a Quaker Cemetery in Charleston, Montgomery County, New York. Only initials - R.H. - are inscribed without listing a full name. Perhaps it belongs to one of the Hoag family which were prevalent in this area. The date of death, though difficult to read, appears to be April 1820.